Sisterhood is an opportunity for Jewish women of all ages to connect with other Jewish women within our own congregation, the surrounding community and the world at large. Congregation Beth Tikvah Sisterhood, an affiliate of the Women of Reform Judaism (WRJ), is comprised of women ranging in age from 18 to over 90. The Sisterhood membership organizes and attends events that are social, educational, fundraising, and religious in order to achieve our goals of enriching the lives of our families and our Beth Tikvah community, as well as the larger communities of which we are a part. As a member of Sisterhood you are providing a strong voice in the community along with other women who have shared interests and a commitment to Tikkun Olam—repairing our world. We offer opportunities for women to participate in and contribute to our congregation to ensure the continued growth and strength of our Sisterhood. Joining the Sisterhood is a great way to meet new people and form lasting friendships. Our members are made up of women – young and experienced, professional and stay-at-home moms, single and married, who form a common bond and share Jewish values. The Sisterhood has held numerous events through the years. The events and programming change with the times, but bonds created stay the same. The Sisterhood board search for fresh and appealing ideas to attract and please its members. We constantly review and evaluate current and past programming. We welcome all women to join Sisterhood and find out what it’s about. Ideas and opinions are important to the future of Beth Tikvah and the Sisterhood. 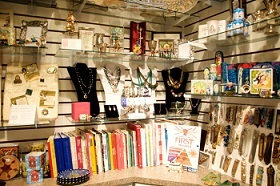 The Sisterhood members also run the Beth Tikvah Judaica Gift Shop. This is the perfect place to shop for all of your holiday and gift items. We invite you to join us for an upcoming event and find out how you can become a part of the Sisterhood at Beth Tikvah. Below is a sampling of some of the programming and events that the Sisterhood has sponsored. For current and upcoming events, please check the temple calendar. To get involved or find out more, contact our Sisterhood President, Rachel Lambermont. For specific information about the Sisterhood Book Club, please contact Rochelle Zweben.